Hole-in-the-wall gang? :The latest theft followed similar robberies at Bank of Ireland branches in Kingscourt, Co Cavan (pictured) and Glendale, Co Tyrone. An ATM was stolen from Glendale Service Station outside Omagh, Co. Tyrone. Detectives investigating the latest theft of an ATM using a digger are probing if the same gang are behind similar incidents. The latest robbery occurred in Irvinestown, Co Fermanagh, and comes just two weeks after two ATMs in Co Cavan and Co Tyrone were stolen on the same night. A digger was used to remove the ATM which was located at a filling station on the Dromore Road in Irvinestown at around 4am on Sunday. The digger used in the robbery is also understood to have been stolen and was set on fire shortly after. Detective Sergeant Brian Reid asked anyone from the area who saw anything suspicious to come forward. 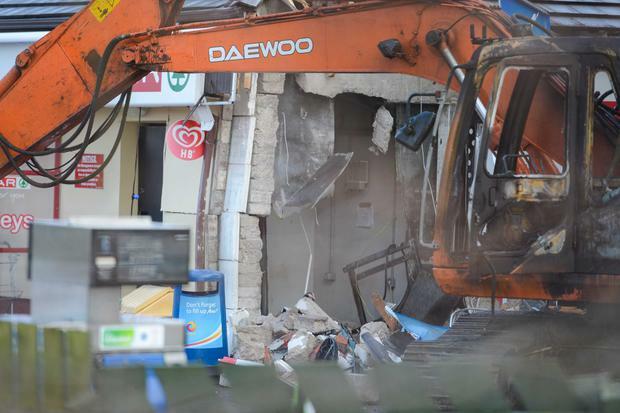 "Thieves used a digger to remove the built-in cash machine from a filling station on the Dromore Road at around 4.05am, causing extensive damage to the building. "We believe the culprits used a trailer to remove the ATM from the scene," he said. "We also believe the digger was stolen from ground under development nearby. "The digger was set alight at the scene immediately after the theft." "We are investigating whether this ATM theft is linked to any other recent thefts," he added. Two separate ATM robberies took place in Cavan and Tyrone in the early hours of March 10. The Cavan robbery took place at a Bank of Ireland on Main Street in Kingscourt at around 4am, and a digger was used to extract the ATM. Meanwhile, at around the same time in Dungannon, Co Tyrone, an ATM was also robbed from a filling station using a digger. 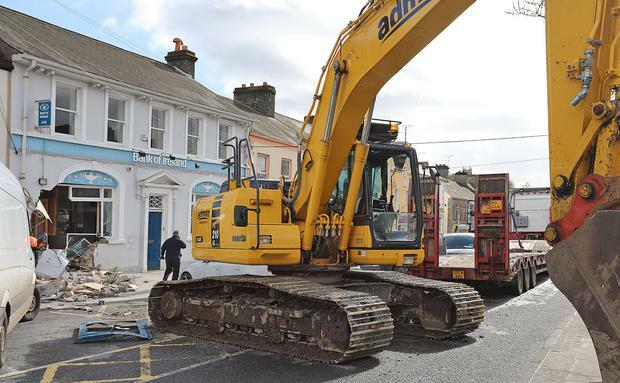 Late last year a digger was also used in the robbery of an ATM from a Bank of Ireland in Monaghan. The incident took place at around 3am on Main Street in Ballybay. The digger used in this incident was said to have been towed to the scene by a large tractor and trailer, with the tractor subsequently set on fire.